Birdhouses are man-made boxes created for birds to make a nest in. Building a birdhouse with your child will help his motor skills and give him a better understanding of nature.Making his own birdhouse will let your child's imagination run wild. You can even help your child create a birdhouse out of recycled supplies and other household items. These birdhouses are perfect for children ages 5 and up. To make a milk carton birdhouse, you will need a half-gallon milk carton, paint, a stapler, a dowel or pencil (for the perch), scissors, markers and string or wire (to hang the birdhouse). Clean the milk carton, and allow it to dry thoroughly. Paint the entire outside and let dry. Staple the top of the milk carton closed. Cut a 1 1/2-inch hole on one side of the milk carton. About an inch under the hole, slide the pencil or wood dowel through the milk carton to create the perch. Leave about an inch sticking out under the hole. Let your child decorate the birdhouse with paint or markers. Attach a piece of string or wire to the milk carton and hang it up. Let your child create a bumblebee birdhouse using an empty coffee can with a plastic lid, acrylic craft paint, tape or glue, a black pipe cleaner, white craft foam, large googly eyes, a piece of wood dowel or pencil, outdoor sealer (optional) and string or wire (to hang the birdhouse). Cut an 1 1/2-inch hole near the center of the plastic lid and poke a hole using the wooden dowel just below the cutout hole. Paint the front of the lid black. Remove any labels and paper from the outside of the coffee can . Paint the can in yellow and black stripes. When the can dries, put the lid back on the can. Cut the white foam folded over in a teardrop shape to make the wings for the bumblebee. Tape or glue the wings on top of the can. Glue the googly eyes on the lid above the hole. Use the black pipe cleaner to make the bumblebee’s antennas by folding the pipe cleaner in half. Take a pencil and wrap the pipe cleaner around it to make the ends of the pipe cleaner curly. Then glue the antennas on the can over the googly eyes. Stick the wooden dowel in the small cutout hole, under the large hole. Tie string or wire around the can and hang it up. You can put an outdoor sealer over the paint to make it more weather resistant. 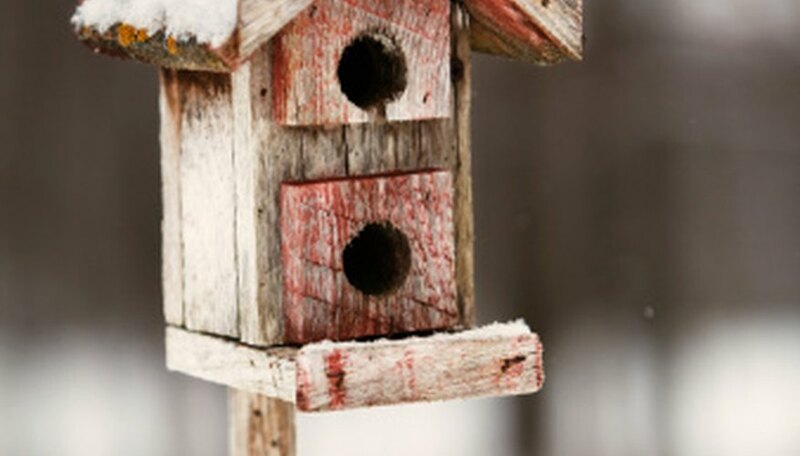 For this birdhouse, you will use a half-gallon milk carton, tacky glue, dark brown or black paint, string or fishing line, a pencil or a wood dowel, scissors and lots of twigs. Measure and mark a line 3-inches from the bottom of the milk carton all around it and cut. You should now have two pieces of the milk carton. Glue the pour spout closed. Cut the bottom piece down to about 1-inch. Put glue around the top outside of the bottom piece and push it up into the top piece, which will create a new base for the milk carton. You do not have to separate the milk carton, but it makes the birdhouse more square instead of rectangle. Cut a 2-inch circle in the front of the milk carton. Stick a pencil or wood dowel through the milk carton under the hole or use a twig here. Paint the entire milk carton black or brown, so that any spaces between twigs will not show up. Use tacky glue and glue twigs all over the milk carton. Glue all twigs lined up going the same directions on all sides of the birdhouse. Hang the birdhouse using fishing line or string.